On the importance of maintaining connections, 1874. Blessed is the True Hawaiian.—In the past months of this year, a certain good woman of this town gathered together all sorts of Hawaiian newspapers and books, and sent them by way of a friend in Oregon for Hawaiians living amongst that unfamiliar people. And just recently in the past few weeks, this good woman of town received a barrel of salmon from the Hawaiians of Oregon with words like this: We are presenting you with this small gift, along with our warm aloha. We are delighted to see the Newspapers and Books you sent by way of _________. Ka Lau Oliva, Buke IV, Helu 12, Aoao 1. Dekemaba 1874. 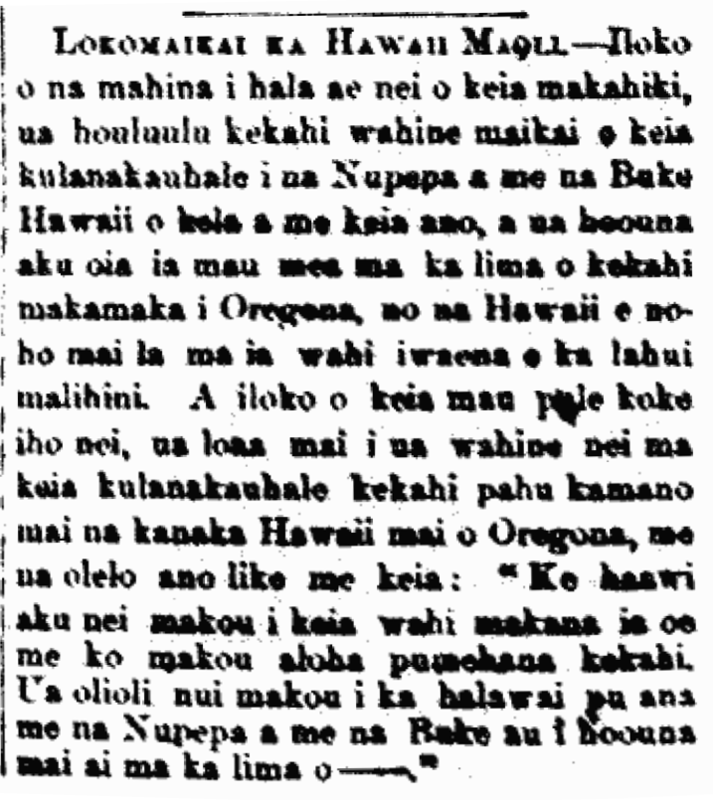 This entry was posted in Book, Hawaiians Abroad, Newspapers Abroad and tagged Oregon by nupepa. Bookmark the permalink.